IT expert Edmund Casino is logical enough to quote the corresponding rule in the 1987 constitution on the mandate of the Comelec. He is very loud to say that they are incompetent or illiterate not to stop counting after a tampering act. It was a nationwide knowledge that Bongbong Marcos was leading at one million votes consistently during the 2016 election. The sudden shift of the total votes after the insertion of a correction can void the rest of the votes because direct tampering is a violation. Therefore, the rest is subject to forensic evaluation. In short, it should be VP Bongbong Marcos, not Leni Robredo. 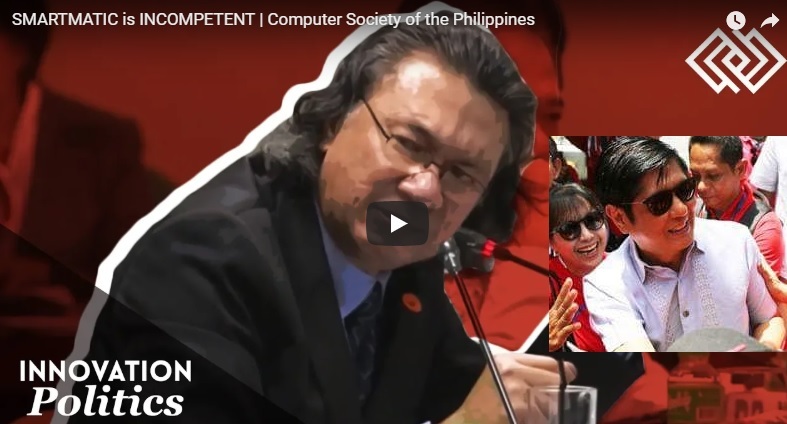 [VIDEO]: Mr. Edmund Casino, an IT expert slams SMARTMATIC, calls it incompetent and unacceptable to the Filipino electorate. The last four year elections are the proofs that Smartmatic is incapable of handling an integral election. Aside from the many anomalies, their system is obsolete. The local IT professionals can even build a much more reliable system. The Comelec is better off if they can revert to manual counting like in 1987. Casino addresses Senator Antonio Trillanes’ inquiry on any judgment of a protest. He vehemently said that the department is the juror, prosecutor, and judge. It can never make a clear and satisfactory decision. Smartmatic does not have the capability since 4 years ago and yet the Comelec is still using the digital election provider. The firm Mr. Casino criticizes the Comelec’s incompetence in understanding basic computer mechanics. They are not literate enough to even understand “WSIWYG” that stands for “What you see is what you get.” Meaning, whatever can be seen in the system must be the same in the image. This is in reference to the boxes found on the images when they are ovals in the actual voting forms. Direct tampering in the middle of a live transmission is a violation. Results prior to that must be the legitimate one. They should have stopped counting and declare whatever the result was. Beyond that is already subject to forensic evaluation. This clearly means that Marcos is the legitimate Vice President. Despite the many cover-ups made by some officials and a majority of the mainstream media, unbiased people who have some sense can easily get the expert opinion of Casino. This is the reason why the Marcos loyalists are demanding for his proclamation at the soonest possible time. Comelec and Smartmatic must stop fooling the Filipinos now. Yes, BongBong Marcos IS the real Vice President of the Philipines. I am just one of the MILLIONS who voted for him who was also cheated by the Leni Robredo. This was in August 2018. Any development on the case after that?